When you have trusted a nursing home to provide care for your loved one, it's unsettling to think that he is being mistreated. However, nursing home abuse is more common than many people believe. Studies have estimated that more than 1 in 10 nursing home residents are subject to some form of abuse. Visiting your loved one regularly is the best way to guard against mistreatment. Nursing homes are not allowed to place unreasonable restrictions on visits, as long as the resident wishes to have visitors. When you visit your loved one, asking targeted questions about daily activities can help you uncover signs of abuse. Nursing home neglect includes practices that place residents at risk of harm due to inappropriate care levels. This could include failing to provide assistance with bathing, dressing, or eating, as well as leaving residents isolated for long periods of time. Neglect can be deliberate or the result of understaffing. Do you think you are left alone for long periods of time? Does a nurse or nurse's aide check on you regularly? Do you feel comfortable asking caretakers for assistance? How often do you go outside? How often do you attend social functions with other residents? What are your mealtimes like? Do you receive your medications when you need them? Have you ever found yourself in need of assistance when no staff members were available? Watching how staff members interact with your loved one and each other can offer additional insight. Caretakers who seem rude, dismissive, or disinterested may not be providing the level of support your loved one needs. Physical abuse refers to the physical mistreatment of your loved one. 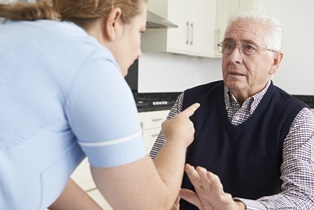 This can be harm caused by care providers who become angry or frustrated, as well as harm caused by other residents who may be acting out due to dementia or cognitive problems. Are you afraid of any staff members or residents here? Has anyone ever yelled at you or made threats? Has anyone ever pushed, shoved, pinched, or kicked you? If you notice any specific cuts, scrapes, bruises, or injuries, ask your loved one for an explanation. If he is reluctant to explain what happened and the staff won't elaborate, this is a warning sign that requires immediate action. If you feel your loved one is in immediate danger, call 911. Financial exploitation refers to practices that involve misappropriation of a senior's assets for monetary gain. This can include instances of petty theft, as well as identity theft or inappropriately obtained power of attorney. Are you able to access your accounts when you need money for your personal expenses? Have you ever noticed any of your things missing from your room? Are you being asked to sign documents you haven't read or don't understand? Have you been pressured to buy items you didn't want or need? Are you being asked to donate to charities you've never heard of? Has someone asked you for monetary gifts or a loan? Has someone asked you to provide personal information such as your birthdate and Social Security number? If your loved one has displayed signs of memory loss, dementia, or cognitive impairment, you might be wondering if he is misinterpreting a situation or not sharing all of the facts. Even if some of the details seem suspicious, trust your instincts. If you feel that something isn't right, take steps to ensure your loved one's safety. Talking to the nursing home administrator should be the first step if you have concerns about the quality of care your loved one has received. If this doesn't resolve the issue to your satisfaction, you should then contact a nursing home abuse attorney to take legal action. Neblett, Beard & Arsenault's award-winning legal team is dedicated to advocating for the rights of vulnerable Louisiana seniors. Contact us online or call us directly at 318.588.6303 to schedule a free, no-obligation initial case review.